Don’t get me wrong, I’m thrilled to be spending time with the family this Christmas, however, there are a few quirks that need adjusting on many levels when it comes to the whole “Christmas festivities”, which happens to fall on Christmas Eve for us. The entire family rounds up at my parents’ house at 7pm. Every single year, my father makes the feast of 7 fishes, because it’s basically the Italian tradition. During the course of a decade, one by one, each family member has begun to start the process of developing some type of allergy to shellfish. My father, being the retired owner of a fish market down on South Street Seaport in New York---he wouldn’t have Christmas any other way. Fish was it. That was the permanent menu from now on. We don’t know any other way. The first sister to develop a shellfish allergy had the worst reaction of all. She literally blew up like a tick and her throat closed up. She had to be sent to the emergency room. Now, because of my father’s demands, she brings a backpack full of Benedryl for the occasion. Then, another sister of mine started to get an all over body rash from eating lobster. She insists it’s not the shellfish and keeps on eating as she turns a bright shade of red- much like a lobster. Then I have another sister who is in the clear----she can eat any fish, shell or no shell. Me? I used to eat shellfish, however, I’m limited to only clams and mussels. If I eat shrimp or lobster, I develop these huge blood blisters inside my mouth. Nobody believed me, especially my mother. “Ohhhh it’s all in your head!” she said, as she kept piling my plate with more shrimp. “You’ve been eating this all your life Debbie! You’re not allergic to shellfish.” she insisted. Then, without hesitation, in front of my family, I opened my mouth and showed them what was brewing. One of my sisters looked and then almost vomited and passed out from the sight. She couldn’t believe what was happening. Mom feared the look on my father’s face, as this meant that Christmas Eve might include a turkey or roasted duck of some sort from now on. How can their daughters be breaking the Italian tradition? The whole ‘it’s all in your head’ bit was a ploy to keep the feast of 7 fishes going. Madelene, my partner, had an experience of her own. While sitting on the couch trying to dissect her huge monstrosity of a lobster, my sister Cathy looks up at her and says, “You do know that’s a huge sea roach, right?” Madelene looked at her—gazed at her in shock, then slowly, placed her overflowing plate of…sea roach onto my mother's gigantic coffee table. Even though Madelene’s not allergic to any shellfish, she no longer touches it. 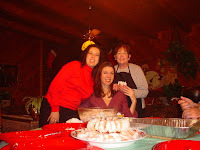 The picture from left to right: Madelene, Tamar and my mother. And yet, there’s another problem I have always witnessed when I was still living at home upstairs from my parents’ house: the timing and preparation of their Christmas festivities. Now not for nothing, but if you’re going cook dinner for a bunch of Italian vultures, I understand if you need to cook the bulk of it a day before. My parents? They start cooking----well, I think today is the day they started! 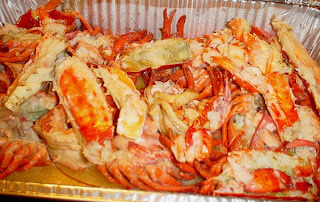 Nobody in my family believed me when I said I smelled shrimp being boiled, lobster being thrown into the pot and clams being baked at 2am----4 days before Christmas Eve! “Oh you’re crazy Deb!” my sisters will say. Crazy? I live here! Are you kidding? I’m witnessing this with my very own nose, eyes and ears and for the love of God, no one believes me! So, with amusement, I sit on the couch and watch my sisters consume some of the fermented goodies going down their intestinal tracks, expecting a call a day later saying, “I don’t know why I’m so sick!" But, I’m a good sister, because I make sure that the martinis are strong enough to handle any bacteria that they gorged themselves with. I hope you and your family enjoy this Christmas holiday. As we say, it’s not the present giving, the food or the spirits---it’s the celebration of Jesus, even if most of us are spending it in the ER.